Club Penguin Cheats by Mimo777 Club Penguin Cheats by Mimo777: Exclusive Club Penguin Shadow Ninja! Dude, Unbelievable Mimo EXCLUSIVE! Someone, who will remain anonymous sent this Club Penguin video to me! This saweet vid shows Happy77 in a Shadow Ninja costume at the Music Jam! So, this got me thinking! 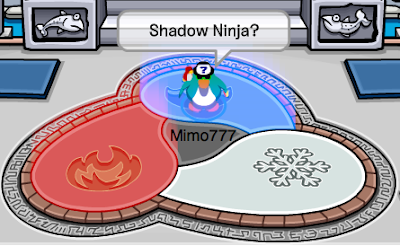 What is a Shadow Ninja? Well, I think it is going to come out AFTER the Snow/Ice Ninja! I think it will be the center spot of the Ninja Amulet! Mimo if you go to the newspapaer go to the Aunt Arctic section and hover over here picture and she might be the Director becuase her glasses turn black! The center on the helmet of shadows has the middle of the middle of hte amulet in it! It's most likely that center gem like you said! If you look closely at Happy77 when she's logging in, he ninja suit has the triangle-shaped gem on the headband, the same one at the center of the amulet! Wow, look epic. Maybe it will come out during next summer or this summer. Maybe once you are a fire, water and snow/ice ninja, you become a stone/shadow ninja. i think it will be a new element.Something like shadow/dark. Yeah it's probably the centre of the amulet. By the way, nice to know Music Jams changed(!) That was sarcasm by the way. Hey Mimo! Did you notice the mirror in the lounge? It finally moved! Happy77 is going to get fired one of these days. Hehe. Mimo, Happy77 herself just posted a comment on the video about an hour ago saying that she didn't take it. The music jam shown is exactly like last year's. I am almost sure this is fake (though I wish it were real). Mimo, great theory! But, there are some flaws I will point out. 1. The center gem is there when you first buy the amulet, so how could you earn it if you already have it? You can only buy the amulet in the hideout so you must be a ninja before you can buy it. 2. The gem most likely stands for the original ninja. 3. The proof from the video shows a 'Shadow Ninja' and it is not poorly made or looking fake. It being real, it must appear at some time in the game. It could appear either in the catalog, when you complete all four (Fire, Water, Snow, Original) Ninjas, or after Snow. Dates are unknown. Any other suggestions? I think they should have card jitsu for the 5 elements Fire,Water,Earth,Wind and Light!! hmm, i agree to stuart57 thats why there was a blackout on the board!